We will tell you how to properly select and care for your new shoes. The simplest way to exactly measure the size of your feet. The number guarantees the correct choice. A ruler or a tape measure will suffice. Put your heel next to a vertical surface (wall) – and that’s it. Pen-trace the outline of your foot on a paper, and measure the result. This is definitely more comfortable. As soon as you have the measurement, find the value below in the MONDOPOINT column. Choose your French value size on the same line. Should your values in millimetre not exactly match, select the closest higher French size. This is because we recommend slightly bigger shoes to make sure you don’t have to bend your toes. In case you’re not sure, please contact us – we’ll be happy to help you. Do not look for a heavy and high boot at all costs. Low shoes could easily do the job. Yet insist on a solid, anti-slip sole. Solid sole, fixed ankle and clima membrane to release sweat – that’s important. A shoe like this will not stop you on your journeys. You need at least 2.6 mm thick material, and you will definitely appreciate the minimum seams and rubber tip protection. High-quality and very effective cream to increase the water repellent features of your shoes. High quality and very effective impregnation for a number of surface materials. Increases the durability and life of the footwear. Even though your shoes are resistant to dampness, we recommend impregnation that will preserve the features for a longer time. Spray the impregnation at least 3 times over. Wait until the first layer is absorbed, and only then apply the next one. Put the impregnated shoes on, and take a walk in a clean environment. Wet leather will better adapt to your feet at this stage. After approximately 15 minutes take the shoes off and let them dry naturally: in 15-30°C this will take a minimum of one hour. 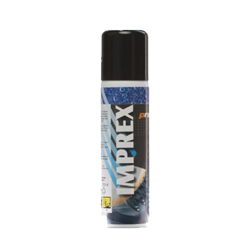 Use an impregnation cream to increase the life after applying the impregnation spray. Use a flannel cloth to polish your shoes after the cream is dry. Depending on how often you use the shoes, and in what environment, repeat the impregnation every 14 days. When you get back from an adventure, remove rough dirt using a soft brush, and dry with a clean cloth. You can take the insole out, and even wash it in a soap powder at temperatures not exceeding 30°C. Don’t dry on a heater, as it could deform the shape. Insert the shoe last and let it dry. When trying to quickly dry (Sun, heater) you’ll risk irreversible damage to the leather. Then impregnate.